Traditional Japanese waxed paper umbrella hand-made from 100% natural materials and fashioned by a skilled team of experienced craftspeople in Kyoto. A dramatic and striking blue and white spiral design. 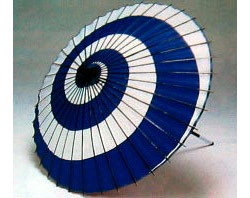 Can be used as a home decoration or as a parasol. Not suitable for use in the rain.